What a difference a week makes – The weather has cooled off, and I have risen above the issue with Di Ford’s BOM. I have decided that I will probably make the quilt, but not until the right fabric comes along. So it is now considered “on the back burner”. 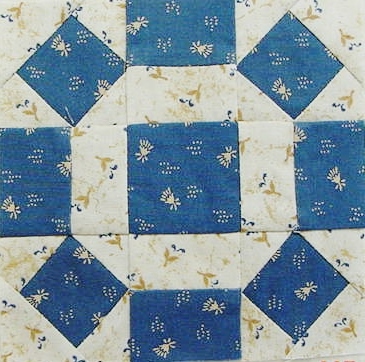 Understanding that I needed a project to work on that would be fun, fast, and stress free – LOL – what quilt project is ever stress free – I turned to Civil War Legacies Carol Hopkins, Handfuls of Scraps and Friendship Triangles by Edyta Sitar in hopes to find a pattern to work on. My quilting buddy Jaydee gave me the Civil War Legacies as she “somehow” ended up with two copies of the book. Speaking of having more than one copy of a book or pattern – I have to admit that I have three (3) COPIES of Elly Sienkiewiczs’ Beloved Baltimore Album Quilts…. I kept thinking that I had not purchased it and kept buying them. Apparently it was one of those times – I call them the “Duh” Days. Jaydee also sent me an early birthday present – the Handfuls of Scraps. Thank you Jaydee! 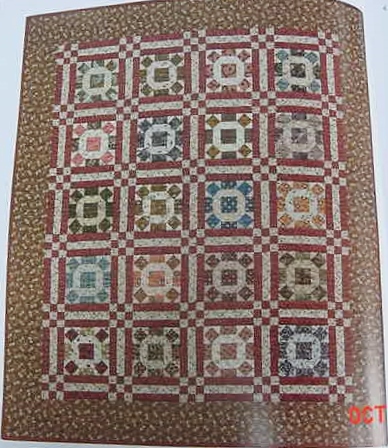 When looking for my next project, I found Alexander’s Bean Pot Quilt in Carol’s book. So I decided to make a nice reproduction lap quilt that would be fun, yet a learning experience. The blocks are 5 inch blocks (unfinished) with sashing cornerstones of 9 patches measuring 2 3/4 inches and strip pieced sashings. One of the things about this project is that Carol has provided the cutting instructions for one block because it is a scrappy quilt. That was what I had just been looking for – a project that would require little time spent in doing a test block to see if problems would arise. WHAT A RELIEF. I am enjoying working on this quilt. I have not made a lot of quilts that have small blocks, and this is a great one to perfect that technique. The block consists of four each 2″ square in a square blocks…. I thought that this would be a challenge, but it has actually become fun making each little block. Selecting different fabrics for individual blocks and cutting them out has ended up being fun! I have finished 3 and have 4 more that I am working on. For the quilt I will need to enlarge the size from 36 3/4″ x 43 1/2″ so rather than 30 blocks I will probably make 35 or 40. For a closer view here are individual pictures of the blocks. I am improving with each block and MIGHT go back and correct the 2 blocks that have “little flaws”. 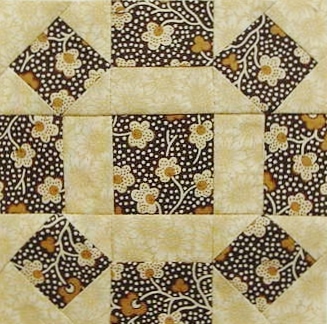 I am also working on my Happy Scrappy and have changed the border – AGAIN! But this time I am happy with the outcome. I will post that one in the next few days. All in all, things are going well since I have changed projects. It is so difficult sometimes to put a project down to work on another time, especially for we Type A personalities. But I am glad that I did for the time being. Have a blessed day and enjoy Fall. 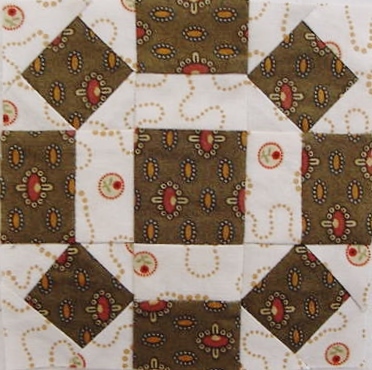 ← Where or Where has my Di Ford Mystery Quilt Project Gone? Hello Nanette, your blocks look great and love your fabric colour and their designs. I have learnt something new since using your smaller pattern. I must keep in mind for my future quilts to get some fabrics with smaller design/prints on them too. So if I need to cut pieces smaller than two inches the fabric design or colour will appear there too. As I’m having to fussy cut one of my fabric’s in your smaller Washington Globetrotting block. My first block is almost ready to sew. Will be taking my time as I want an accurate block. Thanks again Julie Beard. What lovely little blocks! Glad to hear that you are having fun with them! Hehe 😀 Don’t you “love” it when we keep changing border fabric on ourselves?